The ruin Hazmburk is located in the Usti nad Labem district near the town Litomerice. The ruin is the characteristic place of whole Ceske Stredohori hills. Hazmburk lies on a sheer basaltic rock, about 400 meters high. 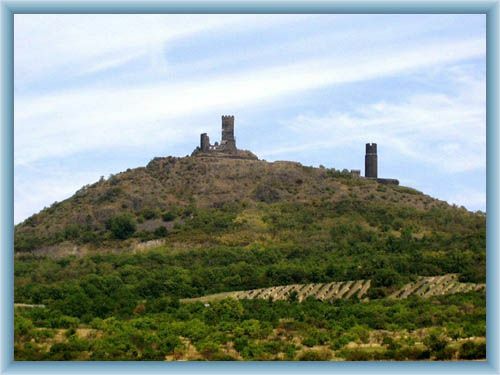 The castle itself is divided into two pars for visitors; the “lower” castle with round “Black” tower (the name is derived from the color of used basaltic) and the prismatic “White” tower made of bright limestone blocks. It is possible to see some remains of palatial buildings and ramparts as well as an interesting tank of water with funneled issue.